Just sorta gets you right here, doesn’t it? 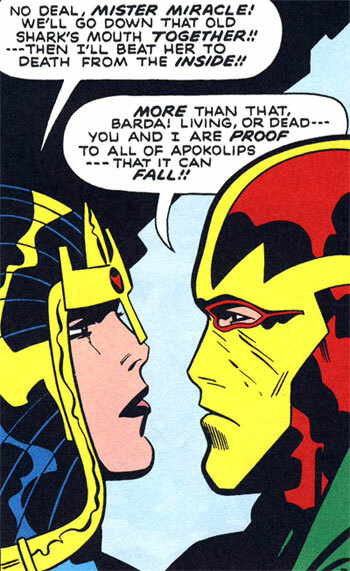 More of Scott Free and Big Barda’s romance–which also involves a battle with Kanto–can be found in the pages of the Fourth World Omnibus v.3 , by–who else?–Jack Kirby. Who, if you’ll remember, also co-created the romance comic. Coincidence? This entry was posted in And Now..., Jack Kirby, Mr. Miracle by Chris Sims. Bookmark the permalink. In my particular belief system, this is the one and only way to consummate a marriage on the wedding night. Wait a minute, you’re proud of seeing “Love Actually”? And instead, we get stuck with Death of the New Gods. Scott Free is seriously one of the coolest characters EVER. Whenever my girlfriend tells me I’m an unfeeling robot, I’m going to ask her whether she loves me enough to jump down a shark’s mouth with me and beat it to death from the inside. Oh, she isn’t? No ring for you girlie! Game, set, match. Is there any problem comics can’t solve? Bardo and Scott were always my favorite comic book couple. I blame Kirby for my fetish for women twice as tall as me who punch things for a living. Here’s to hoping Miracle gets another go when DC’s finished salting the fourth world. If romance comics contained more assassins who love the Renaissance, I’d read them. If I wasnt already married, I would so want to use those lines as vows. I hope somebody out there has or does. When the gang from Riverdale go to the beach, will there be thrills and danger when Betty goes down THAT OLD SHARK’S MOUTH? Oh, wait, this only *sounds* like a couple of days ago. This is truly the test of a relationship. If you and your significant other are not willing to jump down a shark’s throat and beat it to death from the inside, you probably weren’t meant to be. That’s actually how me and my boyfriend met. We both jumped down the throat of the same shark (quite the faux pas in Micronesia!) to punch it to death from the inside and, well, the rest as they say, is history. Once my wife actually jumped down into a shark’s mouth to beat it to death from the inside. After the shark was dead she crawled out and brought out a robot nazi gorilla that was in there that she had to jump down IT’S throat and beat IT to death from the inside before she could beat the shark to death from the inside. GAWD I LOVE THAT WOMAN!!!!!!! What I love about the original Kirby Barda is she always has this serene expression on her face. I think people miss that when they write her nowadays. She’s talking about Granny Goodness, isn’t she? I think Jack based Barda on his wife. She musta been one hell of a woman. I should have worked the whole shark punching thing into my marriage vows. Next time. What!? OUCH! Kidding. My affection for Love Actually–and, therefore, its inherent awesomeness–is a matter of little-referenced ISB continuity. 1. Roz Kirby could beat the living crap out of sharks from the inside. Consider that last bit revenge for the Archie post from 2 days ago. I could have gone my entire damn life without ever knowing what … that thing was. You know what thing. Is it possible that Big Barda and Scott Free are just being sarcastic here? I Like Tony’s comment about Barda’s serenity, although I think of it as composure. One of my favourite Barda portraits is the last panel of page 19 of #8 of the original series. It’s the subtlety with which he conveys her tightly controlled despair. She believes Scott’s dead, but she’s staying in control to destroy their enemies. All divers should carry copies of this picture, it’s way more powerful than bat shark repellent. Big Barda is a fine woman, but do not under any circumstances underestimate the awesomeness of Bat-shark repellent. My noblest goal in life is now this – to find that special lady who will go inside an old shark’s mouth with me and help me beat it to death from the inside. Because, when you get down to it, that’s the true meaning of love. And possibly Christmas. No, wait – Arbor Day. Yes. That is the true meaning of Arbor Day. And thanks for the Chabon link, Scott! That was a really great read. I might even have to repost that on my blog sometime. Edward Liu: Consider that last bit revenge for the Archie post from 2 days ago. I could have gone my entire damn life without ever knowing what … that thing was. You know what thing. All I can say is, don’t let your romantic dreams of a girl you can slide down the shark guts of Life with unhinge your judgement. Remember: that woman is going to be wielding the Mega-Rod in your house. For the rest of your life.